Let’s be clear I talking about the smaller stone, somewhat apt by having a feminine cognomen and is overshadowed by the more masculine 19th-century estate marker. This medieval wayside marker stands beside the Cleveland Way which follows at this point the old packhorse way from Baysdale Abbey southwards to Ryedale. 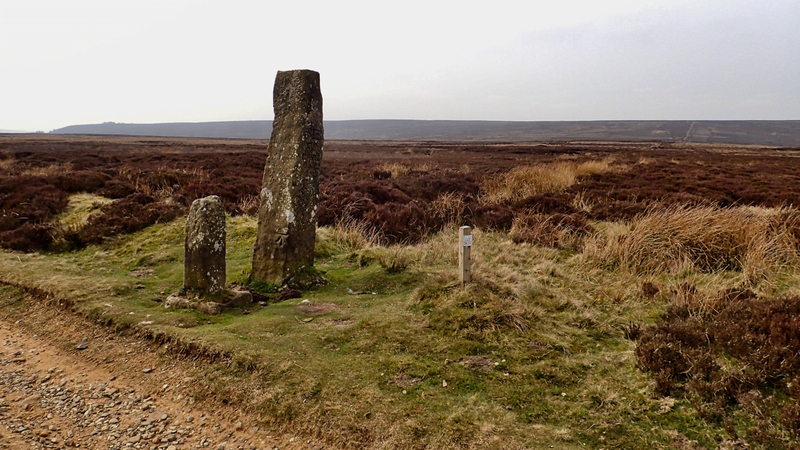 Like a lot of medieval stones, it also marked parochial boundaries and in this case the junction of the parishes of Westerdale, Ingleby Greenhow and Farndale. “Bradley” is said to be a corruption of “breadless”, a place where beggars gathered, although I find it hard to visualise a gathering of beggars on these windswept moors. The larger stone is 18th-century, an estate boundary marker. It has “Sir W Fowels” inscribed on the north side and “F 1838” on the south side. Going by the date of 1838 the “Sir W Fowels” is probably Sir William Foulis, of Ingleby, 8th Baronet and “F” will denote the Earl of Feversham’s land. I read some where that the “Jenny” references on the moors, which there are quite a few, were related to smuggling routes or meeting places. A sort of code.